Tired of doing all your own doodling? It's time-consuming, isn't it? Drawing pictures of spaceships while you wait on the phone, filling in the 'O's in newspaper headlines as you sit on the train, or scribbling random lettering on the back of cigarette packets. Well all that can be a thing of the past! Mark Fawcet is a freelance illustrator and graphic designer, and he is now available for all your home and office doodling needs. And what can Mark do for you? 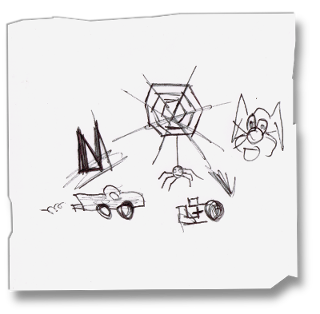 Well, not only will he be able to save you time and effort, he can also produce doodles to professional standard. No more stick men on your notepad or meaningless squiggles at the back of your diary; Mark will provide doodles of distinction and quality that will make you the envy of your friends and colleagues. Mark's number can be found in the Yellow Pages, usually scribbled in the margin under 'Heating Engineers', next to the crudely drawn picture of a rabbit.